Northern Star Industries, Inc. acquired THE BOSS Snowplow more than 24 years ago and quickly became an industry leader and innovator. Using new technology and state-of-the-art engineering and manufacturing, the company has pioneered a number of revolutionary features and equipment additions for snowplows, setting new standards within the industry. SmartHitch®--changing forever the standard in snowplow attachment time, SmartHitch allows snowplow operators to attach and detach a plow in a matter of seconds in three very simple steps. SmartHitch represents the latest in breakthrough technology for snowplow mounting systems. Power-V Multiposition Plow--synonymous with THE BOSS, the Power-V Plow, introduced and perfected by the company more than two decades ago, is the industry standard for multiposition snowplows. SmartLight™--It's no secret that visibility is a major concern when plowing or transporting a snowplow. That's why SmartLight2 illuminates wider, farther and more consistently than any other plow light on the market today. Our state-of-the-art reflector optics and Dual Bulb Illumination provide a more consistent light pattern not found in competitor light packages. And when you have a long night of plowing ahead of you, Halogen InfraRed (HIR) bulbs provide a whiter light that's less fatiguing to the eyes. SmartShield®--Setting the standard in the industry for paint finishes, THE BOSS SmartShield baked-on powder-coat paint finish begins with an exclusive zinc primer. The zinc primer adheres to the metal better providing superior corrosion resistance and gives each plow a high gloss shine that keeps your plow looking great for years to come. 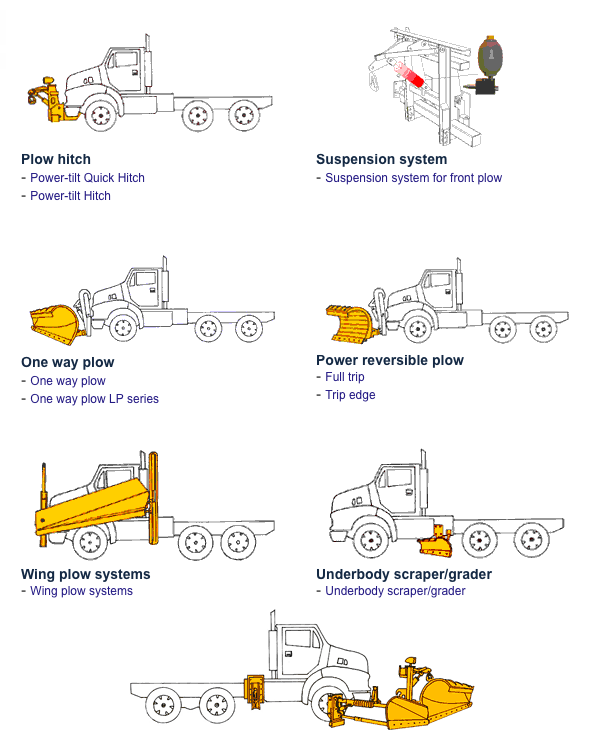 Power-V Multiposition Plows for 1/2 through 2-ton trucks. Straight-Blade Plows for downsized 4x4s, 1/2 through 2-ton trucks and SUVs. Straight-Blade Snowplows for Skid Steers. Salt Spreaders for 1/2 through 1-ton trucks. THE BOSS Snowplow is designed and manufactured in Michigan's Upper Peninsula where winter and deep snow are a way of life. All of THE BOSS Snowplow products are designed, manufactured and put to the ultimate test at the company's ISO 9001:2000 registered facility. trailer market, the company has experienced tremendous growth and market acceptance. For more information please visit the downeaster website here. available in stainless and poly - electric and hydraulic - 1/3 to 15 yard capacity. Founded in 1946, Buyers Products is a fully integrated manufacturer and a leader in the truck equipment industry. Our engineering, manufacturing and assembly operations take place in the USA. From snow and ice equipment to toolboxes, hydraulics, towing, truck and trailer hardware – to our fast growing and innovative lighting products – it’s amazing what we can do for your truck… But Buyers is more than just parts. Phil Larochelle Équipement Inc. designs top quality specialized equipment for trucks. Years of experience have afforded us an expertise that offers you durable, cutting edge products for increased efficiency and performance. Our technical team work using the latest available technologies and develop equipment that are known for their modular, modern and optimized design. With flexible methods of engineering and a variety of available options, we can easily customize products to suit all of your specifications and needs. Gledhill Road Machinery Company has manufactured some of the world's finest snow plow and road maintenance equipment since 1930. Products include the JETSTREAM™ snow plow, straight and tapered moldboard snow plows, patrol leveling and full benching truck leveling wings, truck hitches, tail-spin spreaders and the Niagara Falls spreader. All equipment is available with a wide range of options for your custom application. Pioneers in snow removal and road maintenance since 1891. Every Root product, whether underbody scraper, blade, or plow, is engineered and built with painstaking care. From the day in 1891 that we introduced our first product right up to the present, we’ve conscientiously made quality our crowning achievement. That’s why Root products thrive on the roughest, toughest work you can give them. Special heavy-duty high-carbon steel, all heat treated for brute strength and longer scraper life. Cushioned-spring moldboards to absorb road shocks, save trucks from life-shortening jolts, wear and tear. Standard, no extra cost. Heavy-duty 3/4 in. entirely welded steel circles, no castings. Power reverse action available on five models. With the Root product line, you’re assured of quality back-up service. Remember, it’s not the original cost. It’s the equipment’s durability and its service back-up that truly count.